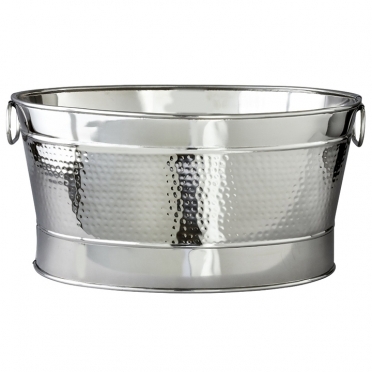 To get your large party started, you need our "Hammered Oval Tub." It is large enough to hold a great amount of beer, wine coolers, or soda. Thanks to the stainless steel construction, it will look appealing at any venue without detracting from the decor. The hand-hammered details add a touch of class to the item, and the solid handle makes it easy to carry from place to place.